Note: When using this mashup API, app developers may be unaware of where the backend data comes from. All an app developer knows about is how to call your proxy. The details of how the data is retrieved and mashed up are not necessarily exposed. The Google Geocoding API: This API converts addresses (like "1600 Amphitheatre Parkway, Mountain View, CA") into geographic coordinates (like latitude 37.423021 and longitude -122.083739). The Google Elevation API: This API provides a simple interface to query locations on the earth for elevation data. In this example, the coordinates returned from the Geocoding API will be used as input into this API. This is a typical pattern where APIs are chained together using proxies. The response is a JSON object that includes the geocoded location (latitude/longitude) for the center of the supplied postal code area combined with the elevation at that geocoded location. How an API proxy project is organized on your filesystem, as explained in API Proxy Configuration Reference. This cookbook topic demonstrates local development (file system-based) as opposed to cloud-based development where you could use the management UI to develop the API proxy. If you have downloaded the sample code, you can locate all of the files discussed in this topic in the mashup-policy-cookbook sample folder. The following sections discuss the sample code in detail. Note: This is a ProxyEndpoint flow. 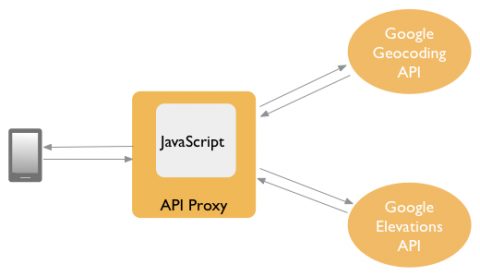 The ProxyEndpoint configuration defines the inbound (app-facing) interface for an API proxy. When you configure a ProxyEndpoint, you define how apps invoke the proxied API. <HttpProxyConnection> - Specifies details about how apps will connect to this API proxy, including the <BasePath>, which specifies how this API will be called. As mentioned previously, this code includes Apigee-specific variables and objects. The variables are included through the API proxy runtime environment. They include request, response, request.queryParams, response.content, and response.headers. These variables are populated whenever an app submits a request to the API proxy. For more information about variables and how they participate in the API proxy environment, see Variables reference.